I was asked over on Facebook, if I was able to share my version of Sarah Wilson’s Raspberry Ripple. Sarah’s version is made with butter, so I substituted butter with coconut oil to make my version dairy free, as well as gluten and refined sugar free. 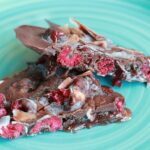 This is one of my favourite quick-to-make dessert recipes and is up there with my Chocolate Chip Cookie Dough Bars, Coconut Rough and Macadamia Chocolate Bark. Add the cacao and your choice of sweetener and stir till it is well combined and the sweetener has melted. It usually takes around 5 minutes and I whisk it to make sure that it combined well.